When Hernando Vasquez walked into the North American coalition embassy in Madrid and torched everything just by flaring at it, everybody knew: zeeks are among us. Some people hate 'em; some people love 'em. And make no mistake about it, tomo, that means most people either want to shoot them or use them to their own ends. But then I suppose that just makes life more intersting, ne? 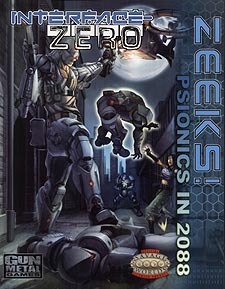 Zeeks: Psionics In 2088 gives you an opportunity to explore the subculture of zeeks, either as a GM wanting to incorporate them into your game or a player wishing to play a psychic character. Whether you want to have a full-blown campaign focusing on the tumultuous world of psions, or just know what might be lurking back there in the shadows, we've got your back - everything from the Psi-Hunters who stalk zeeks to the fringe cults that worship them. Loads of information about psions and how they fit into t eworld of Interface Zero. Rules for creating psionic characters for Interface Zero, including new Edges, Hindrances and Powers. A new system for Savage Psionics, without the Power Points - and still Fast, Furious and Fun. More occupations for your characters, as well as new goodies from Malmart. Two complete Savage Tales and a half-dozen plot hooks to help bring zeeks into your game. Stats for new NPC friends and enemies, as well as stats for a few... other things. This is an expanison for Savage Worlds Interface Zero, and not a stand-alone setting.